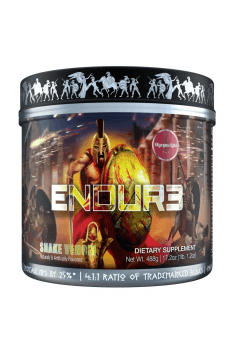 Olympus Labs Endur3 is a complex pre-workout supplement containing a number of carefully-selected substances able to strengthen the organism as well as boost anabolic processes and reduce tiredness. The supplement was designed to increase training efficiency to a great extent by providing compounds facilitating muscle mass growth and boosting energy, which is essential for heavy physical effort. Moreover, the preparation ensures proper electrolyte levels and regeneration while reducing post-workout muscle soreness. InstAminos is a blend of as many as 7.5 g of branched-chain amino acids (BCAAs) per serving, that is: L-leucine, L-valine, and L-isoleucine in the proportion 4:1:1. Branched-chain amino acids perform various functions in the diet of athletes. One of them is supporting anabolic processes in muscle cells. BCAAs are proteinogenic exogenous amino acids, which means they enable protein biosynthesis but must be delivered with food. It is thanks to them that muscles grow and regenerate after heavy physical workout. A correlation has also been demonstrated between branched-chain amino acid supplementation and increased secretion of anabolic hormones, such as growth hormone or insulin. A substance of particular significance in the product is L-leucine, whose amount per serving is as much as 5 g. Its role consists in activating kinase mTOR, that is the enzyme whose functions include increasing the speed of protein biosynthesis by affecting transcription and translation processes. It has even been demonstrated that insufficient leucine supply leads to a decrease in protein production by cells, which makes supplementation of the amino acid extremely important. Velositol is a blend speeding up protein synthesis in muscle fibres by even 25%. It provides two invaluable components: amylopectin and chromium. The first one is the main component of starch, and in terms of chemical structure, it is a branched glucose polymer. That means it can be an excellent source of energy for cells, particularly muscle and nerve cells. The other component of Velositol, is chromium, a trace element that works in synergy with insulin, increasing its anabolic properties. As a result, it helps to boost muscle mass growth and replenish glycogen reserves in muscles. L-Glutamine is one of twenty proteinogenic amino acids that greatly supports anabolic and anticatabolic processes. Providing the right amounts of L-glutamine in periods of increased physical activity or chronic stress prevents the loss of muscle mass and stimulates the regeneration of skeletal muscles. Moreover, glutamine can constitute an alternative source of energy for cells, as it can be transformed into pyruvic, citric, or lactic acid, all of which participate in the process of obtaining energy by cells. L-Taurine is a biogenic amino acid formed in the organism in the process of cysteine metabolism. Taurine supports creatine transport to muscles, which increases its activity and boosts energy even more. It also has a beneficial effect on digestion and lipid absorption by bile acid conjugation and the facilitation of fat emulsion. Taurine is also a neurotransmitter in the central nervous system – it has a positive effect on cognitive processes, including perception and memory. It also increases the speed of metabolism of nerve cells and glial cells supporting them. Electrolyte Matrix provides essential minerals (calcium, magnesium, sodium, and potassium) in the form of easily-assimilable salts of citric, aspartic, and phosphoric acids. The blend helps to replenish electrolytes lost during workout, for example with sweat, and supports the proper hydration and functioning of the organism. Sodium (as sodium citrate) is an element constituting the main extracellular cation. It maintains cell excitability, which enables, for example, impulse transmission by nerve cells, or muscle stimulation to grow. It also plays an important role in maintaining osmotic balance of bodily fluids and increases tissue hydration. Potassium (as potassium citrate) is the main intracellular cation and, just like sodium, it helps to maintain the action potential of cell membranes. It also activates numerous enzymes and regulates the functioning of the heart and skeletal muscles. Magnesium (as magnesium aspartate) is a macroelement determining the normal functioning of the nervous system, ATP synthesis, and the work of the ribosomes that synthesise protein in cells. It also constitutes a prosthetic group for over 300 enzymes, also those responsible for the metabolism of nucleic acids (DNA and RNA). Calcium (as dicalcium phosphate) is the main component of teeth and bones. It performs multiple functions in the organism; for example, it participates in muscle contractions, blood coagulation, or cell signalling. Calcium ions are also necessary for neurotransmission (they release neurotransmitters from synapses), and regulate hormone secretion. Vita Cherry Sport is an ingredient based on anthocyanines obtained from cherries. The compounds, one of plant colourants, perform antioxidant functions in the organism. They prevent the toxic activity of reactive oxygen species, which cause cell damage, speed up aging processes, and destroy the structure of proteins and other macromolecules. Anthocyanines contained in cherries also seem to have a beneficial effect on reducing post-workout muscle and joint soreness, as well as enhance sleep quality. To sum up, Olympus Labs Endur3 is a pre- and post-workout supplement with a wide range of activities. It helps the organism to face all the challenges posed by physical effort. It supports the regeneration and growth of muscle mass, reduces the feeling of tiredness and muscle soreness, helps to replenish electrolytes and boosts energy. Take 1 scoop mixed with 300ml water during desired excercise activity. Take 1 scoop at any time mixed with 300ml water. This product works best when it is taken before or immediately after exercise, but it can also be taken between meals at reasonable intervals to prevent catabolism and promote muscle growth. This preparation can be combined with creatine, which will further strengthen the muscles and facilitate the performance of additional exercises, which will make the workout more intense and effective. Citric Acid, Malic acid, silica, natural and artificial flavors, sucralose, acesulfame potassium FD&C Yellow #5. Xtreme Electrolyte Matrix is a complex of electrolytes containing calcium phosphates and potassium., necessary for the proper course of metabolism. Potassium, due to influence on hydration of cells regulates the volume and stabilizes the osmotic pressure, acting as a calcium antagonist increases the permeability of cell membranes. It also maintains the correct acid-alkaline balance. Calcium is the building substance of bones and teeth, an activator of a number of enzymes, including ATPases, releasing ATP energy, reduces the permeability of cell membranes (stimulated, however, by the action of potassium hydroxide). Deficiencies of potassium (hypokalaemia) appeares insomnia, headaches, spasticity skeletal muscle hyperactivity, skin dryness and constipation. Deficiencies of calcium affect bone diseases and dental health. Xtreme Electrolyte Matrix is a part of the supplements by Fitness Authority.